Better health leads to a better you. Our Group Exercise classes offer a variety of aerobic, stretching and fitness classes, both in the Dance Studio for Group Exercise and the Indoor Aquatic Center for Aqua Aerobics classes. These classes are available to all members and day pass holders for strength, cardio, endurance, flexibility and agility classes. As a member of The Salvation Army Kroc Center, all members will receive a complimentary 20-minute fitness consultation. This individualized workout includes a fitness assessment, body composition report, extensive warm-up and cool down, as well as exercises based on personal progression. This workout is recommended for individuals who are looking to address individual goals with practice and demonstration. This workout combines body weight, muscle conditioning, cardio and plyometric training moves synced to original music that has been specifically designed to match every single move. Every squat, every lunge, every burpee is driven by the music, helping you make it to that last rep, and maybe even five more. This fun and challenging cardio workout will enhance your speed, strength, and stamina. Great music and motivational instructors will improve your overall physical health and endurance. This unique combination of cycle and core training emphasizes the importance of core strength as it relates to maintaining proper cycling form and endurance for sprinting and climbing. Core training will help to build a solid foundation for all aspects of physical fitness. High-Intensity Interval Training (HIIT) includes a core workout and ends with a unique cool down. HIIT ramps up fat burning, elevates your heart rate faster and your metabolism longer, letting you burn additional total calories in a shorter amount of time. HIIT results in EPOC, an after-burn effect which causes you to burn calories for hours after your workout is completed. Come for the challenge! This class offers whole-body exercises requiring full body interation and core stabilization. Kettlebell training will build long lean muscles, improve strength and power in the upper body, core and lower body and increase coordination, joint mobility and overall endurance. Drop-in Group Exercise & Aqua Aerobics classes are a perfect way to learn a new skill, make friends or improve your fitness. Now offering a variety of activities, just pick up a Class Pass at the Welcome Desk a half hour before the class start time to secure your position in the class. Class times are subject to change. SpinPower is science-based training principles for individual weight loss, fitness and performance goals; individualized training programs using the Personal Spinning Threshold (PST) Test and Spinpower Zones; high-quality, power-oriented Spinning classes built around effective, individualized program design and post-ride data analysis. The class is designed to bring members to the next level of indoor cycling and fitness by mastering the science of health, fitness and performance, utilizing power meter technology that was once available only to elite level cyclists. Recharge your body and mind as you take health to a new level in this action-packed boot camp session. These sessions are designed to increase your strength and agility using conditioning drills, resistance training, high repetitions, and intervals. Improvements in your health and strength are best achieved with a strong weekly commitment. A slow-paced stretching class with some simple breathing exercises and meditation. This is a good place to learn basic poses, relaxation techniques, and become comfortable with yoga. Yoga may help reduce stress and blood pressure, improve concentration and sleep and treat conditions such as arthritis and asthma. Vinyasa is a fun, vibrant 60-minute practice designed to release tension and promote strength and increase flexibility. This class includes postures in the vinyasa flow style followed by a shorter period of relaxation and meditation. The intention is to promote health, peace, and well-being. Kick Boxing is a combination of intense moves all perfectly choreographed to high energy and motivating music. It's the ultimate cardiovascular challenge that's a unique blend of intense intervals strength/endurance training and a relaxing cool-down. Total body strength and conditioning class incorporating muscle balancing and body awareness. Modifiable to all levels. Get ready to Strengthen, tone and define your body. The workout combines the key principles of Pilates core stability and the traditional style of boot camp training. This is a fitness and resistance training exercise that includes Pilates elements along with popular fitness moves such as lunges, squats, dips, mountain climbers, half burpees, and push-ups. Burn and firm in no time with this high-intensity class designed specifically for weight and fat loss. Zumba Gold targets the largest growing segment of the population: baby boomers. It takes the Zumba formula and modifies the moves and pacing to suit the needs of the active older participant, as well as those just starting their journey to a fit and healthy lifestyle. What stays the same are all the elements the Zumba Fitness-Party is known for: the zesty Latin music, like salsa, merengue, cumbia and reggaeton; the exhilarating, easy-to-follow moves; and the invigorating, party-like atmosphere. Active older adults want camaraderie, excitement, and fitness as a regular part of their weekly schedule. Zumba Gold is the perfect fit. It’s a dance-fitness class that feels friendly, and most of all, fun. High-Intensity Interval Training uses the stepper, includes a core workout, and ends with a unique cool down. HIIT ramps up fat burning, elevates your heart rate faster and your metabolism longer, letting you burn additional total calories in a shorter amount of time. HIIT results in EPOC, an after-burn effect which causes you to burn calories for hours after your workout is completed. Come for the challenge! Yoga and Pilates are blended together to create an atmosphere that is complete for all fitness levels- from beginner to fitness enthusiast. Taking the best from Hatha Yoga and Pilates to create a flow that allows you strengthen and tone your entire body with just one class each week. Zumba combines traditional Latin dance styles, including salsa, cha-cha, mambo, cumbia merengue, as well as hip-hop depending on the instructor's preferences. Some classes will also utilize traditional group exercise and fitness moves. Keep active and stay young at heart with Senior Fitness. An innovative class combining sculpting and low impact moves using weights and chair exercises followed by a little dancing and guided relaxation. Intervals, circuits, and athletic movements will intensify your water experience. This total body workout will focus on cardiovascular and strength training exercises in the water. This drop-in low-intensity water aerobics class is appropriate for all fitness levels. This class will help improve balance, joint strength, and arthritis. Did you know that we have FREE Fitness Assessments available for members? Our Certified Fitness Specialists will guide you through a series of tests that could include cardiovascular endurance assessment on a treadmill or other fitness equipment, assessments of muscular strength, endurance, flexibility, blood pressure, heart rate and body composition to help determine your fitness level. Using a combination of your testing results and your personal goals we will then determine the best possible fitness routine for you. To get started, visit the Welcome Desk and complete a Health History Questionnaire and Fitness Consultation Request Form. A Fitness Specialist will call you to schedule your appointment. 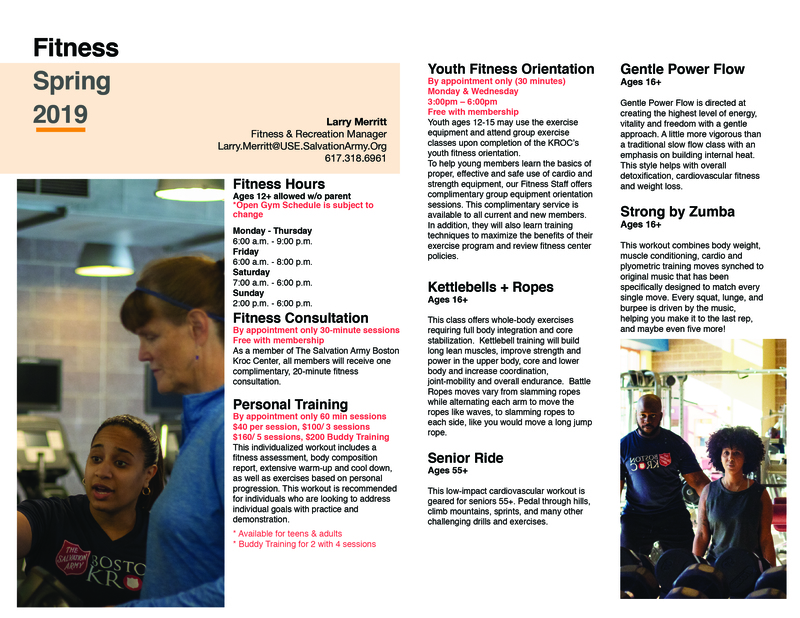 Call the Fitness Department at 617-318-6961 or email Larry Merritt at larry.merritt@use.SalvationArmy.org.